As far as ancient Irish Celtic symbols go the Claddagh ring is arguably one of the most popular. 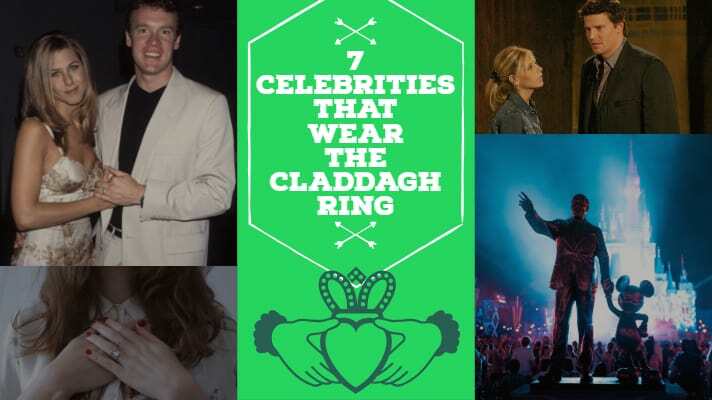 Today I will be sharing seven famous celebrities that wear the Claddagh ring. What does the Claddagh ring represent? The Claddagh ring (Irish: fáinne Chladaigh) is a traditional Irish ring which represents love, loyalty, and friendship (the hands represent friendship, the heart represents love, and the crown represents loyalty). On the left hand with the point of the heart toward the wrist: the wearer is married. Is that a Claddagh ring on his hand? Remember Joshua from friends? Tate Donovan, they were in a brief short-term relationship and allegedly exchanged Claddagh rings. They exchanged Claddagh rings to celebrate their first anniversary. Ah, Buffy the vampire slayer! If you were born after the year 2000, you probably don’t know what I am talking about. the Claddagh ring made an appearance for “Buffy’s” 17th birthday and fans went crazy for it! Angel gave Buffy the ring to celebrate their eternal love for each. Here is it on Amazon. Back when President John F. Kennedy and his wife Jackie visited Galway in 1963 they were presented with a pair of Claddagh rings to honour Kennedy’s Irish roots. Fun fact: Ronald Reagan was also gifted with a Claddagh ring from the people of Galway in 1984. There is actually a statue of Walt Disney, in Disney land wearing the ring. Just shows you the sheer reach the Celtic symbol had. He and Lillian bought the Claddagh rings for one another on a trip to Ireland and wore them every day(wow). Ironically the ring is upside down! We weren’t lying when we said the ring has been worn by a number of famous celebrities. Kim Kardashian and Kayne were on holiday in Ireland back in 2014. Kanye picked up an Irish Claddagh ring along the way to give to Kim as a keepsake of their time here. While there has been no siting of her actually wearing it, we will be sure to update if there is. It is believed the ring was a traditional silver version similar to this. Rock God Jim Morrison famously exchanged Claddagh Rings with Patricia Kennealy in a Celtic wedding ceremony. Jim wore a gold one and Patricia wearing a silver one. Julia was spotted wearing the Claddagh ring in 1995 when she was in a brief romance with Daniel Day-Lewis. Bill Clinton, Winston Churchill, Bing Crosby, Mia Farrow, Sienna Miller, John Wayne and Maureen O’Hara have all been pictured wearing Claddagh rings. A number of Irish-American characters wear Claddagh rings in the 1998 movie “Monument Ave”. Only really authentic Claddagh rings can be purchased in Galway, Ireland but often people are not too concerned with this. However, if you are ever in Galway, Ireland make sure you pick one of these historic Celtic symbols up for yourself. Other symbols such as the Celtic Cross and the tree of life have also made their way into the present day. Be sure to share this post if you have a Claddagh ring or pin the image below to your Pinterest board.